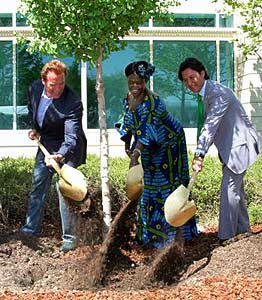 California Governor Arnold Schwarzenegger along with Nobel Peace Prize winner Dr. Wangari Maathai, and Shaklee CEO Roger Barnett planted a Ginkgo tree on the grounds of Shaklee's Pleasanton, Calif., headquarters on Wednesday, April 22, 2009 in honor of Earth Day and Shaklee's Million Trees, Million Dreams program. Maathai is the "global ambassador" for the company's "A Million Trees, A Million Dreams" campaign. Her group, based in Kenya, started in 1977 with tree plantings and is a way to empower women by getting them involved with the environment. "We owe a lot to trees," she said. "We ought to have a lot of respect for the trees." This is very nice to read..